My journey in the Southern Rhône comes to an end at Tavel and Lirac – two towns which are a mere six minutes from each other. There is always more to expound about the riches of the Rhône, such as the areas of Luberon, the Ventoux and the Vaucluse. 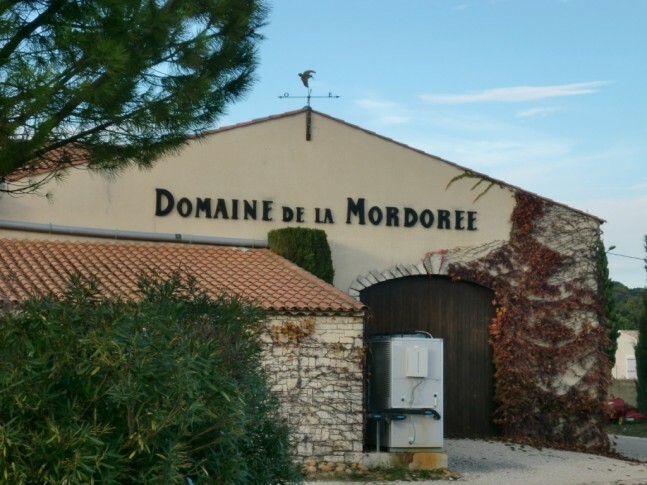 Domaine Faverot, Domaine de la Citadelle and Domaine de Tara are producers I would recommend for those who are interested in getting a taste of the diversity of the South of South. The flavour profiles there remind me of the punchiness of South Australian wines. However, those finer details would be better-suited for a story in the future. My focus is on Tavel and Lirac. The vines of Tavel date back to 879 AD but became a favourite with the Pope when the papal court was established in Avignon during the 14th Century. Avignon – being only 24 kilometres south-east of Tavel – made the wines of Tavel very assessable for trading. Like the neighbouring Châeaunuef-du-Pape, the Vignerons of Tavel have always been proud of their wines and serious about creating a product of quality. A consular decision was recorded in 1716 concerning the creation of measures to fight fraudulent bottles which claimed that they originated from Tavel. In 1737, both Tavel and Lirac saw the first semblance of France’s AOC system when the words CDR (Côte du Rhône) had to be marked with a hot iron seal on barrels transporting the wine to authenticate their origins. In 1754, there was a ban on the harvesting of grapes which were not considered ripe enough to produce quality wines. The reputation of Tavel wines grew steadily until the arrival of phylloxera. The region became an AOC in 1936. Since then, only rosé is allowed to be made from Grenache at a proportion between 30 to 60%. The rest of the blend consists of the typical Southern Rhône varietals with up to 10% of Calitor, Carignan Rouge or Blanc. The rosés are made usually by cold maceration of the harvested grapes for 6 to 48 hours to extract colour and flavour from the skins under a blanket of inert gas. The must is allowed to be bled out, allowing the free run juice to be removed before pressing. Sometimes, the must is kept longer after the bleeding has occurred and then blended back with the free-run juice. This is done so as to make the wines more tannic, darker in colour and powerful in aromas. The blending can take place before or after the fermentation. Fermentation usually takes place between 16 to 20°C for around 8 to even 30 days. There is a significant difference between the rosés made here in Tavel compared to those in Provence and the Luberon. Not only are the colours deeper, but there is more texture in the wines of Tavel. The flavours are more robust, fruit-forward juicy flavours on the palate. Many critics would be quick to point out that the method of bleeding or saignée as they would call it in French is a lazy method of making rosé. Perhaps this perception comes from wineries who use saignée to improve the concentration of the must so that they can create a more flavourful and powerful red wine. To not waste the juice that has been removed from the must, they bottle it as rosé, thus creating a new product to generate extra revenue for the winery. However, the vignerons in Tavel are not creating two products from one technique but are dedicated to create just one – the rosé. Moreover, it is not as simple as bleeding off the juice and bottling the fermented bled-off juice as a rosé. The magic in Tavel is the use of different varietals to create layers of flavour instead of depending on a single varietal. Blending the free-run juice with the pressed juice requires an understanding of how both juices will affect the final product. The wine-maker must possess knowledge about the cut-off point of the pressings before the juice degrades to a poor quality. Lirac is considered to be the one of the oldest, if not the oldest wine-producing region in the Côte de Rhône. It is said that Lirac was already planting vines since pre-Roman times. The Pope, King Henry IV and King Louis XIV of France would drink them regularly in their courts. It is said that the Great Phylloxera blight of France started from Lirac in 1863 after the owner at Château de Clary planted vines from California in his own vineyards. Lirac is the first AOC in the Rhône to be given the right to produce all three types of wines: red, white and rosé. Their red and rosé wines are made mainly from Grenache, Cinsault, Mourvèdre and Syrah. The blend consists of minimum 40% Grenache. The white is made mainly from Clairette, Bourboulenc, Roussanne and Grenache Blanc. Being six minutes from each other, it is not strange to find that both towns have soils which are quite similar. Lirac is comprised of terraces and hills that run from North-east to South-west at elevations between 50 to 200 metres. The high terraces contain red clay with large pebbles and on the slopes, loess and calcareous-clay can be found. This makes the vines susceptible to drought during hot summers. Although the majority of soils are sandy and red clay, there are specific areas which have hard layers of limestone that run deep down the soils and underground water reserves that give sustenance to the vines. 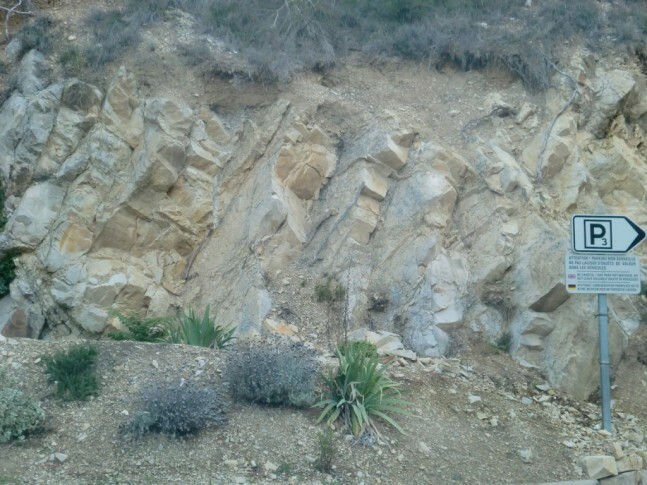 “Saint-Laurent-des-Arbres” in Lirac has particularly rocky pebbles on the top layer and red soil on the surface which is also similar to the soils of the “Vallongues” in Tavel containing Quartz round pebbles. I believe these soils are not only iron-rich but have an ability to keep the soils warm at night due to the amount of scree present. There is a portion of land in Tavel called “Les Vestides” is extremely infertile and full of limestone fragments. On the east of the Tavel village towards Châteaunuef-du-Pape (CDP), there is a parcel of land which has similar round stones and heat-retaining properties as CDP. However, certain parcels near “Saint-Géniès-de-Comolas” are particularly sandy. Round pebbles & limestone over sand and clay can be found at the south of St-Géniès on the hillsides. Overall, the soils of Tavel have poor organic matter and humus levels which are good for growing vines but if the vines are not tended steadfastly, they will see nutrient deficiencies. There can be as little as a 2°C difference between east and west of Tavel due to the Mistral winds and the different soils. Temperatures in the summer are 22°C and 7.3°C in the winter. The summer experiences 200mm of rain and 500mm for the rest of the year. Both Tavel and Lirac are about an average of 120 metres above sea level and have parts of their land facing from south-west to north-east. They endure 2700 hours of sunshine, an average rainfall of 700mm and the battering of the Mistral wind for 180 days per year. How did two almost similar terriors end up with such different rules about what wine they are permitted to make? I could not find any information about this peculiar moment when it was decided that Tavel would make solely rosé. The only clue I got was from my guide, Mike. I was told by him that Tavel and CDP have parcels of land which have similar soils to one another and so, Baron Le Roy, the man who initiated the creation of the France’s AOC system, spoke to the vignerons of Tavel and CDP. In 1935, he somehow managed to convince the Tavel vignerons to make rosé and the CDP vignerons to make red and white wines so that both villages would have no competition with each other. I do not know the veracity of this explanation but it sounds reasonable enough. There is still one mystery to be solved, which I have yet to investigate. What happens to the remaining components after bleeding the juice from the vats to make Tavel Rosé? Do any go into the Côte du Rhône blends or bottled as a separate wines under a Vin de France. It would be a waste to not utilise the remaining grape must to make a separate blend since the juice is more concentrated after bleeding and the grapes are of good quality since they can come from soils in Tavel that rival that to CDP. I shall find the answers when I return to the Rhône someday. The co-operative owns 800 hectares of vines. The cold maceration is from 12-24 hours and then the tank is bled. 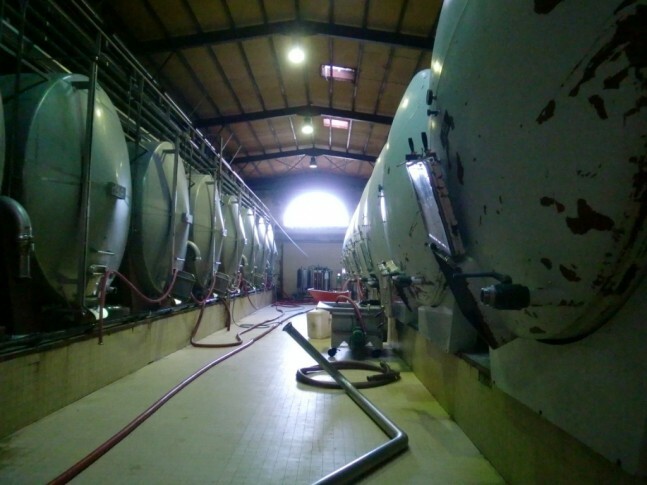 Cement tanks with double doors (top and bottom) are used so that the winemaker can decide to take the juice from either the top or the bottom. It takes as little as 30 minutes of soaking to change the colour of the juice. According to the French law, each tank must be numbered stating its capacity in hectolitres. The juice is transferred to horizontal stainless steel tanks. For the Lirac reds, they are fermented at 25 degree Celsius in roto-fermenters. Bright pink colour. Medium intensity nose, cherries and raspberries. On the palate, medium(+) acid, light tannins, medium length, a sort of fat and glycerol taste, light berries balanced with some phenolics. Pale pink colour. Light berry fruit. On the palate, light vanilla, med(+) alcohol and medium acid, medium length, cedar and rice grain flavours in the back. Bright salmon colour. Medium intensity, light currants on the nose. On the palate, mineral, high acid and light tannins, a steely wine with med(+) alcohol, med(+) length, some pressing flavours in the back. On Chalky soils. Best served at 10 to 12 degrees. Bright red colour. Light berry and confectionary nose, light intensity. On the palate, raspberry, light tannins, med(+) acid, long length, light berry finish and redcurrants. Pale green colour. Light toast, durian, pungent and fleshy like a jack fruit, vanilla. On the palate, light vinous, long length but slight phenolics and bitterness in the back, needs more time to prop up the mid-palate. 4-6 months in barrels with Battonage. Med(+) purple colour. Raw nose of redcurrants, cherries, med intensity. On the palate, chunky tannins, medium intensity, red cherries, light herbs finish, medium length, cherry back palate, slightly extracted on the bitter tannins but for the price, acceptable. Very Grenache dominant. 10 ha produced 40 hl of wine. The Domaine is run by the brothers Christophe and Fabrice Deforme. It was started in 1986 by Father and brothers. The philosophy of the domaine is to create wines which would not only reflect the land, but have a low impact on nature during the creation process. The domaine will be certified organic in 2013. The estate is named after the Mordorée bird which I was told is a woodcock. Pale pink colour. Red berry fruit on the nose. On the palate, red berries, medium length, and a berry finish. Soft in the back. This is a Vin de France which is the same as a Vin de Table. In the past, it used to be a VdP de Gard. 9 year old vines on sandy clay soil. Fermented at 18 degrees. 100% de-stem, using the saignée method. Pale red colour. Fruit compote aromas, red currants, fruit cake, a slight sweetness on the nose. On the palate, fruits of med(+) acid, very sweet spice, cinnamon, long length, beautiful finish, light tannin, sweet spice on the back. 100 % destemmed, cold maceration for 48 h, pneumatic pressed, fermented at 18° C. No MLF. Vines are 40 years old on clay and chalk soil with sand and pebble stones. Best served at 10 to 12 degrees. A very good wine that can be kept for 5 to 6 years. Long for a rosé but this is excellent quality. Transparent green. Nose of white peaches, lemon, med intensity, lime, citrus and lightly floral. On the palate, citrusy, lime, high acid, very fresh, med(+) length with a citrus finish. The terrior is clay and chalk with pebbles. All hand harvested and seen some skin contact. 25% has seen oak. From 30 year old vines. Deep purple colour. Red berry nose, spicy, black pepper, red cherries, piquant on the nose. On the palate, liquorice, med(+) acid and tannins, chunky tannins, med length, a savoury sweet finish. No oak at all. The vines are 40 years on clay, chalk, clay, limestone and sandy with pebble stones. 100% destemmed, 30 days maceration with 34 degrees temperature. This is a lovely food wine that can go well with pork with red tomato sauce or something gamey. Deep purple colour. Light wood and cedar aromas, beautiful on the nose, lifted, light spicy, caramel. On the palate, tannins are pluckery, med(+) alcohol, juicy, vanilla, a complete mid-palate with some menthol flavours, complex with a long length. 1 year in old oak. This wine is so concentrated in flavours. Deep purple colour. Raw nose with blackberry, still closed but it is like a flower waiting to blossom. On the palate, pluckery texture, lots of fruit and black ink, long length and a lingering earth and savoury taste. This wine has lots of potential and I am looking forward to drinking this again in 2 years.